Quilted musings: December 8th Already! Holy Cow! December 8th Already! Holy Cow! Hello, I'm still here, been sidetracked by family needs and Thanksgiving! I've been plugging away on the customer quilts as well as my decorations for Christmas. Both are moving along, slowly but making progress! I've quilted a quilt made from men's clothing, it had shirts and pants in it, very nicely done and easier than I thought to quilt. 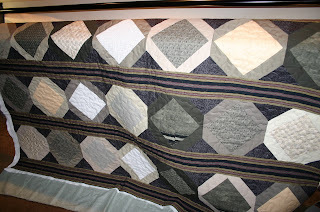 It was quilted with a basic meander in Superior's Rainbows thread to match the quilt. I just finished an Oriental quilt made for a lucky granddaughter, the pattern is Terry Atkinson's Snapshot & I'll post a pic when I take one! More to come later, just wanted to catch up! Enjoy the season, there's snow still on the ground here from Saturday!